I agree with fireside about the floor/wall/ceiling joins though - too sharp - maybe a simple 4 poly 'corner shadow' would help? They're going to be playing it on a telephone and we're looking at a lot larger screen. It looks really good. 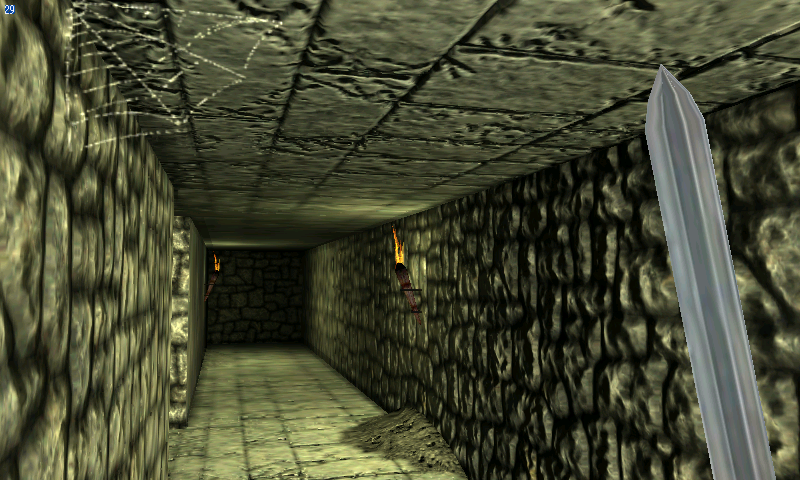 You could darken the ceiling and floor texture a little, but I like to be able to see what I'm doing even in dungeons. For simplicity, i would add them only in hallways, i.e. not in larger rooms and not in junctions or corners. What do you think...and does anybody have a nicely textured model that i could use? Maybe using a few more polygons than just a box...? Hmm... 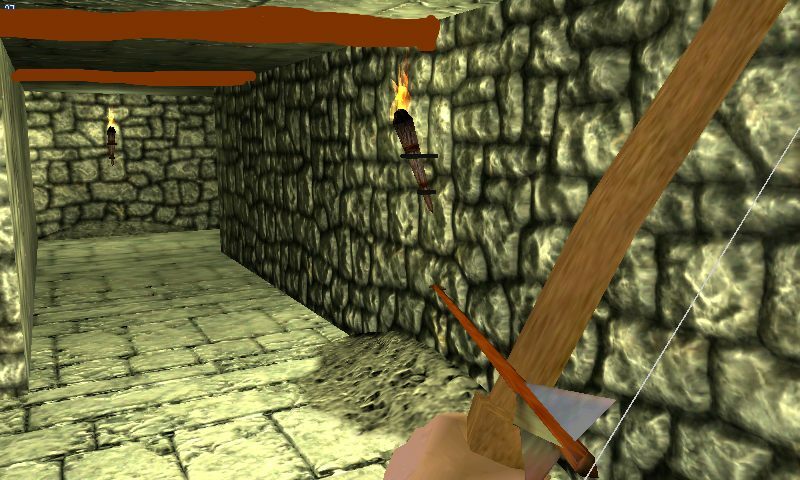 Roof beams aren't that dungeon-like! I haven't forgotten the cobwebs either! I think beams might add some variety. You'll probably want to experiment with different textures and other things to add variety to the dungeons, for instance rock or dirt walls that aren't cut. Posts and beams would probably look good with dirt walls. I've never been in a dungeon so I can't comment on those beams. However, you could change the texture of the roof to a dark wooden plank texture to blend the wall texture in a bit better. And perhaps add injected 'shadow' textures on the floor where it runs along the wall edge so the contrast between the wall edge and floor are closer. Depends on the dungeon, i think. They don't have to look like wood...they could also be made of stone. I don't see, why that shouldn't fit. At least it's an option to add some variety. Not all dungeons will look the same anyway. The cobwebs are animated using a simple vertex shader, but it would look better if the texturing would be reversed, i.e. if the end of the web would be where the two polygons of the plane meet. Oo! It's starting to look like Skyrim! That cobweb texture is way too loose though - it looks out of scale. I can easily fix the poly/tex thing for animation - should I add a few more polys to it for the animation or is 2 polys OK? Can anyone find a better texture? @Fireside: fancy a go? I'm no artist! I do think that the corner shadows help to take away that pixelated line, but as fireside says, darkening the edges (or all) of the floor texture would do the same job without the need for those extra transparent polys. I like the corner shadow and the cobweb. Looks really good.